As part of efforts to reposition the University in the area of internationalisation, the Directorate of Grants Management (DGM), recently organised a two-day, European Commission Funding Opportunities for Academic Staff Write-Shop for those in the cadres of Lecturer I and above, that is; Senior Lecturers, Readers and Professors. 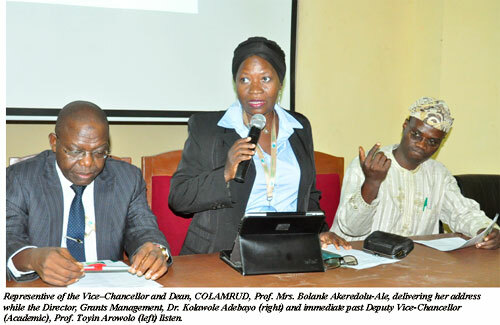 Reiterating the University’s commitment towards activities geared at attaining a world-class status, the Vice-Chancellor, Professor Olusola Oyewole, said the Write-Shop, the second in the series to be organised by DGM, would adequately equip participants with the needed skills to apply and win grants under the European Union framework for research and innovation. 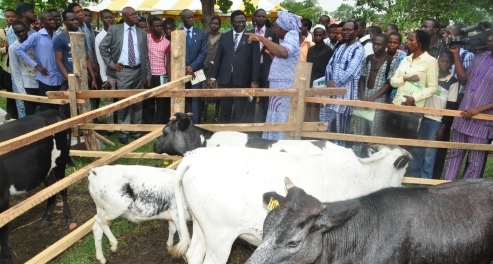 Professor Oyewole, who was represented by the Dean, College of Agricultural Management and Rural Development (COLAMRUD), Prof. Bolanle Akeredolu-Ale, said it was heartwarming to know that the Directorate’s effort had started yielding fruits, as three grants had been awarded to staff of the University by the International Foundation of Science (IFS), while expressing the hope that more of such awards were still being expected. The Vice-Chancellor charged the participants to make the best use of the opportunity, stressing that, “many earlier career academics did not have similar privileges, or that it took them several years to be able to tap into it”. He disclosed that in support of the fund-seeking efforts of participants, the Management of the University had approved the provision of mobile internet facilities. Earlier, the Director of DGM, Dr. Kolawole Adebayo, said the Write-Shop, which was the second in the series, was organised for Academic Staff because winning European Union grants required a lot of experience and hence, the justification for the programme. He added that another important thing to note about the grant, was that the amount of money usually involved was large. Dr. Adebayo thereafter, expressed his appreciation to the Vice-Chancellor for his support and for granting approval that 50 persons be empowered at the Write-Shop after which eight good proposals were expected to be submitted to the EU.